Dexion’s range of shelf, hanging and stackable bins allow you to sort small parts any way you like. Maxi bins come in six sizes and five different colours. They can be stacked, hung off louvred panels or incorporated into other Dexion storage systems. When placed on a shelf they create convenient drawer-like access for small parts. 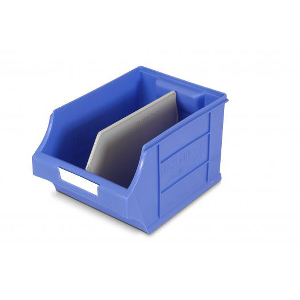 Integrate Dexion shelf bins with other Dexion products for the ultimate small parts storage solution.